We love the snow too! Snow is not the only thing we are hoping for in the air at this time of year! We are close to Valentine’s Day, and Big Bear Lake shows its love with a good covering of snow on the ground, some cooler weekend temperatures, and plenty of activities for couples to do while you are here in the mountains. Enjoy walking in the woods, skiing down the mountains, and other adventures to be found that are perfect for two. The weather looks like it loves us this week too! It’s winter in the mountains. The natural thing to want to do is glide down the nicely covered slopes with your significant other. 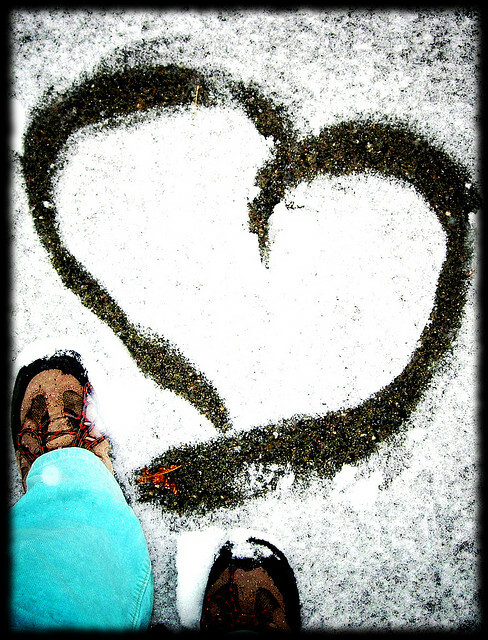 Valentine’s Day is for doing something special, and there are a few places in Big Bear ready for you! Helicopter Big Bear has a special trip for the month of February. They call it the Helicopter Sightseeing Flight for Love Birds, offering a gorgeous tour of the valley with a few extra luxuries for you both. If a helicopter doesn’t have the thrills you are looking for, ditch it and still soar above the snow with an Action Tour. The nice people over at Action Tours are offering good discounts on their zipline and Segway tours if you mention that you want the Get Some Action on Valentines when you make your reservation. The Segway tours have limited availability, so make those reservations as soon as possible! Of course, there is no denying that there will be plenty of couples on the mountains. Through Friday, Goldsmith’s Board House has you both covered. When you rent one set of equipment, you can get the other set for free. They are also offering some discounts for outerwear rentals, so you can try out new gear or experience skiing for the first time. Now that you are prepared for your journey down the mountain, Big Bear Mountain Resorts has the passes waiting! Purchase one ticket online between February 6th and 13th, and you get the second one for free! The tickets must be used between the 12th and 14th. Just remember, when you’re out skiing and snowboarding, falling head over heels is not the way to do it. Save that for your significant other. You have been out all day, exploring the wilderness and hitting the slopes. Now it is time to relax and enjoy the evening. You might be a little sore from the events of the day, but no need to worry; Mobile Mountain Massage and Altitudes Massage both offer the ability to book their massage services right in your cabin! Make sure you reserve it in advance, since the offers are limited to right around Valentine’s Day itself. Once you have been pampered, it is time for dinner, drinks, and dancing! You can make plans to attend any of the great restaurants in Big Bear, like the Knickerbocker Mansion, the Sweet Basil Bistro (which has a very special Valentine’s Day menu), the Peppercorn Grille, or just pop into any of the great places that the area offers to enjoy a romantic evening. There are still a few rooms for the weekend, but they are going fast! Make sure you make your reservations soon. From high flying romance to relaxing with a drink and some nice music, Big Bear Lake is ready for Valentine’s Day weekend! We look forward to seeing all of you happy couples up here on the mountain. Gallery | This entry was posted in What to see and do and tagged Adventure, Bear Mountain, Big Bear CA, big bear lake, cabins, couples, date, events, fun, gift, helicopter, helicopter Big Bear, love, massage, relaxing, romance, romantic, romantic evening, Segway, skiing, snowboarding, spa, vacation, Valentine's Day, weather, What to Do, winter, zipline. Bookmark the permalink.